If you’ve ever launched the App Store in iOS to discover the “Updates” tab is empty, but you know for certain that an app update is widely available, you may have run into a peculiar and frustrating bug within iOS. Unlike the Mac App Store with Command+R, there is no easy way to ‘refresh’ the App Store in iOS, and while quitting out of the app sometimes works, it often doesn’t, and you’re left with an empty updates screen on the iPhone or iPad. If you run into an empty Updates section of the App Store despite knowing with certainty that updates are available to your installed apps, try one of the two following solutions to resolve the problem and to download the newest versions of the apps in question. Why this works isn’t entirely clear, but presumably it forces the App Store to rescan for available updates for the apps that are currently installed. You must have internet access for this to work, which shouldn’t be an issue for an iPhone as long as there’s either a signal or wifi connection, whereas an iPod Touch or iPad will need to be on wi-fi. 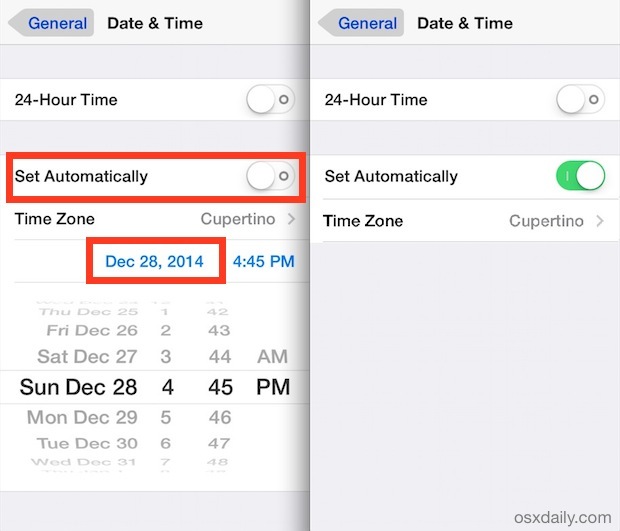 Unfortunately, that date switcheroo doesn’t work every time, so if you get stuck in a situation where the Updates section is still not showing anything, your next choice is to be a little more aggressive. As long as the newest version is visible in the App Store on the individual app listing page, that new version will download, despite not showing up in the “Updates” section. 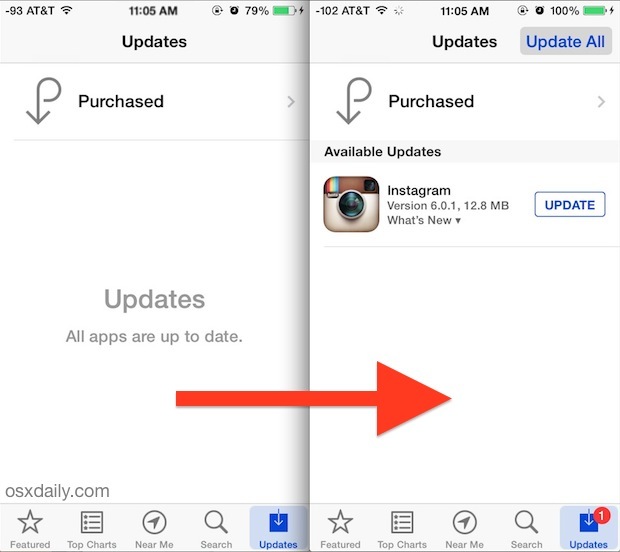 I ran into this problem recently with an Instagram update, which was widely available for most users, even shown as available on the App Store page for the app, but it never properly displayed as available in the “Updates” section. The solution in this case was to delete the old Instagram app from the iPhone, then find it and re-download the newest version from the App Store. Clunky, and obviously not ideal, but it works. This behavior is likely a bug of some sort, as it’s totally random and doesn’t happen with any certainty or under any repeatable set of conditions. An option to forcibly refresh the App Store caches and Updates list in iOS could potentially resolve the problem too (you can do that in iTunes on a Mac or PC), but in the meantime troubleshooting requires either manually trashing apps or toggling the date as described here. If you know of another trick that works to forcibly update apps when they’re not displaying in the App Store, let us know in the comments. It happens the same with iTunes. Closing or quitting the App Store app through the fast app switcher (multitasking interface) (by double-tapping the home button), and then re-launching the App Store app again (to refresh) seems to work fine for me. both solutions does not work for me. “Reset all Settings” works but the problem would re-surface after awhile. Does it(“Reset all Settings” ) works? I tried both solutions in here but it doesn’t work for me too. Please let me know if it is works. I don’t know why, but when I turned off my wifi connection then used data connection instead, all 11 updates just magically appeared. Now I often use data connection to check for updates which is somehow a hassle because I really don’t use it often before. When I join Wifi network my apps start to update automatically while the automatic update is off in my settings and I don’t want them to be updated.can you help me to deal with problem? I resetted the appstore application cache from the iphone appstore app & it works. For resetting the appstore cache on iPhone click on any Tab bar icon (bottom bar buttons) in Appstore app in iPhone 10 times qucikly. this will reset the cache and Icons will be downloaded again. The only way out for me was to switch off my phone and switch back on – the updates then appeared… certainly a lot quicker fix than the 2 mentioned in the post.. not an elegant or permanent fix, but it works! I hope this helps others with the same issue.. Updates stopped working a week or so ago and nothing will reinstate them. I’ll call Apple on Monday to find out why they’ve stopped them. What a load of baloney. Didn’t work.